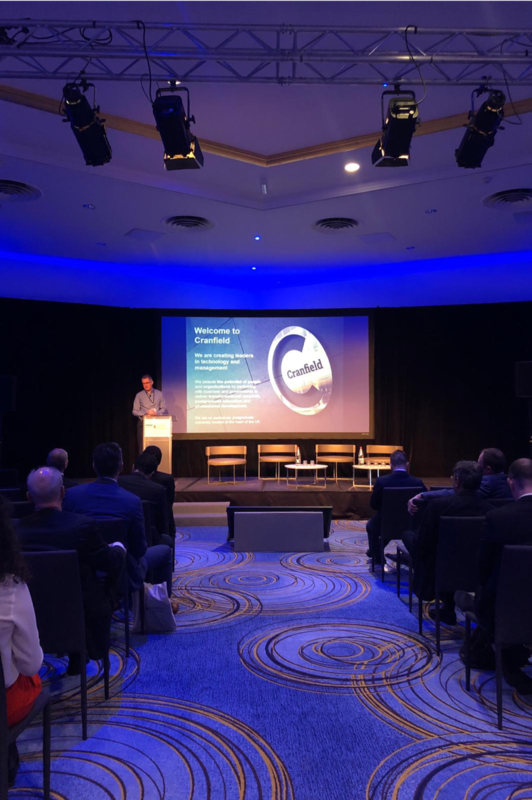 Recently, the 12th CleanEquity Conference, hosted by Innovator Capital and the Monaco Economic Board, was held in Monaco, where a gathering of scale-ups pitching for investment and exciting panel discussions and networking took place. Out of the 170 delegates, 4 of the visitors were students from Cranfield University, an established sponsor of the event. Sophy and Jayesh were representing the School of Management and Harris and Cynthia were from the School of Water, Energy and Environment and the School of Aerospace, Transport and Manufacturing respectively, both had submitted winning ideas for new sustainable businesses thereby demonstrating that at Cranfield, entrepreneurship can be found across the campus. These are their perspectives on the proceedings of the conference. 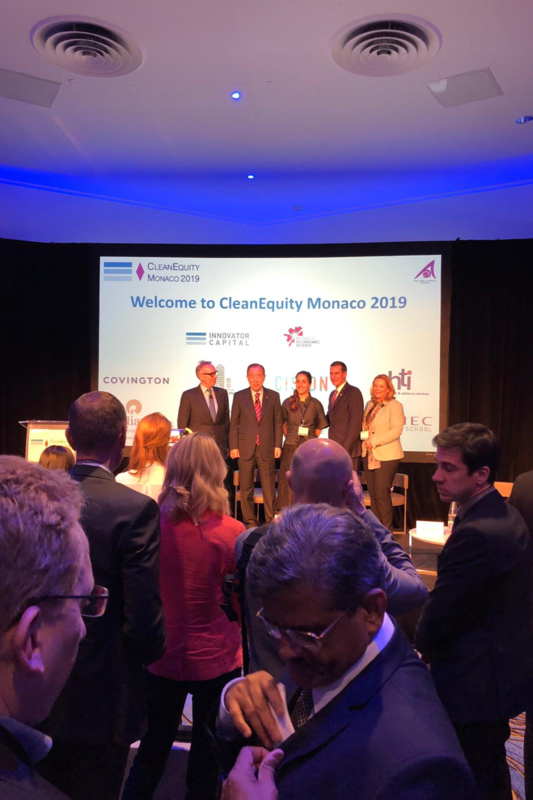 I was chosen to represent Cranfield University at CleanEquity Monaco 2019. Being a student of MSc Management and Entrepreneurship, volunteering for this event proved to be a big confidence booster. I had seldom beliefs when it came to building businesses through the point of view of sustainability. However, meeting the world’s preeminent people like former UN Secretary General Ban Ki-moon, global investors, pitching companies, sponsors of the conference, and other invitees, broadened my thought process towards building big businesses through environment-benefitting technologies. Seeing pitching companies bringing forward their efforts towards saving the environment with a commercially viable idea allowed me to aspire for larger objectives. The pitch sessions involved some companies introducing their technologies, while some requiring funds, some looking for team members, and the rest introducing new projects. Interacting with the attendees we asked for tips and guidance for to-be-entrepreneurs and received extremely helpful advice.It was an amazing experience working with fellow volunteers from Edhec Business School and the organizing team from Innovator Capital. We assisted the team in terms of arrangement of materials in the event, guiding attendees to the right venues, helping with anything they needed, moderating pitches, and assisting in Q&A sessions during speeches and panel discussions. It was great learning to know how conferences of such high importance are organized. It was an amazing experience working with fellow volunteers from Edhec Business School and the organizing team from Innovator Capital. We assisted the team in terms of arrangement of materials in the event, guiding attendees to the right venues, helping with anything they needed, moderating pitches, and assisting in Q&A sessions during speeches and panel discussions. It was great learning to know how conferences of such high importance are organized. 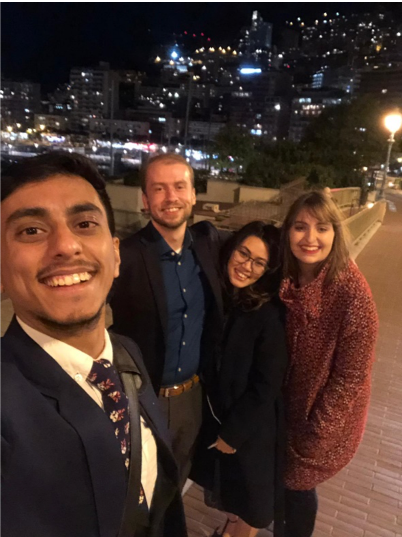 I had a great opportunity to join the team that represented Cranfield University at the CleanEquity 2019 conference. The first aspect that made this experience a wonderful one was its setting: Monaco. Get lost in the middle of the city, walking along the same roads as the Formula 1 follows and enjoying the sun just characterised the perfect beginning. As an Automotive Engineering MSc student, the future about clean mobility is one of my interests. The second day was mainly dedicated to new companies whose principle aim was to introduce electricity in our transport system and, even more, improve this new technology. As an incredible example, we heard the speech by SUN Mobility, a company that is boosting the battery sharing in India. However, the best moment came up when we participated in a discussion about the challenges of mobility during which the formula 1 champion driver Nico Rosberg contributed his thoughts. We had a great discussion with him and, for sure, took some photos! I am really thankful to the whole Research and Innovation Cranfield University department for this opportunity and for my colleagues Harris, Jayesh and Sophy, who made this an even more incredible experience. What do you make of an event aimed at helping to pave the way for mankind to avert catastrophic climate change whilst set against the backdrop of a city that caters for the world’s largest diesel-powered mega yachts, helicopter commuting and extravagant supercar-driven luxury lifestyles? In short, people don’t change, or at least our values don’t, but incorporating them into a solution that might be on the face of it diametrically opposed to our behaviours may be the difference between a Europe with a submerged Monaco or not! The ventures that pitched during the conference that were awarded for their impact understood this; SUN Mobility’s ambitious plan to bring electrification to India’s diverse road transport sector was based not only on sophisticated technology but a profound appreciation of every stakeholder; SUN Mobility’s co-founder’s secret weapon lay in understanding exactly what would make a driver on the streets of Bengaluru embrace charging one of their batteries instead of filling up at a gas station. This sentiment was echoed by another company, Green Harvest One, who had an ingenious approach to working with the well-established conservatism that has defined the USA’s agriculture sector. This amazing opportunity to experience this side of technology will have a profound impact on my research and career direction as I hope to expand my horizons to include the influences of shareholders and investors. With encouragement from the eighth UN Secretary-General, the Investment Association of China’s ground-breaking proposal and the radical innovations and progressive approaches taken by VCs, family offices and fund managers, the conference made clear that sustainability doesn’t just make sense for the planet but holds the key to ushering in a completely new and exciting way of doing business with people at the centre. 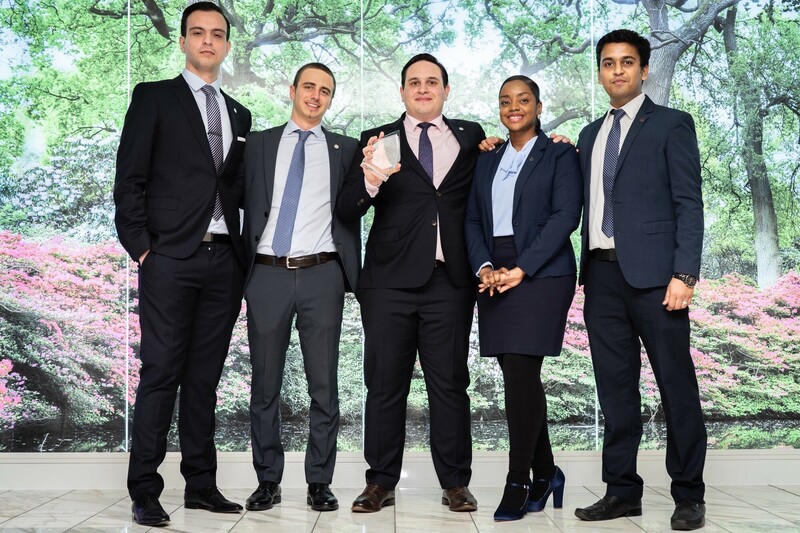 Getting to represent Cranfield during CleanEquity Monaco 2019 was an amazing experience. The journey began with a touchdown at the spectacular Nice Côte d’Azur Airport located right by the ocean. The famous south of France and Monaco sunshine greeted us with the warmth and energy we needed to run an intensive yet exciting two-day event. Once we arrived at Monaco the day before the event, we busied ourselves with all the logistics planning and ensuring every detail of various programs for the next two days. The thoughtful planning by the hosts is evident with the agenda filled with a balanced distribution of addresses, panel discussions, pitches and breaks. To me, the most remarkable experience was having the opportunity to listen to the keynote address by SG Ban Ki-moon as well as witnessing some of the most incredible pitches. As an aspiring entrepreneur, being able to witness the pitches first-hand was like the lecture-room materials jumping out of the slides into real life. It was both inspiring and thought-provoking. The optimism, the intellect and the energy radiated in those rooms in those two days were something to carry forward as we progress to the sustainable future not just by words but by actions in our day-to-day lives.